Technology is changing the lives of every living thing on our planet and at a speed difficult to grasp. Then there is the question of direction – where is the tech world taking us, and to what end? To begin understanding these issues, it helps to have insight from someone who lives and breathes technology, but at the same time is not so consumed by it that they lose touch with everyday realities. Someone driven by the outcome of their efforts for human beings, rather than the pursuit of technology for its own sake. Shafin Diamond Tejani, CEO of Victory Square Technologies (CSE:VST), is firmly in the former group. With a vision for his company built around clear opinions on future trends, he speaks sincerely about both increasing shareholder value and the positive influence he and his team can have on local communities…and those not so local. At the end of the day, Tejani believes the benefits are there for all of us to share. 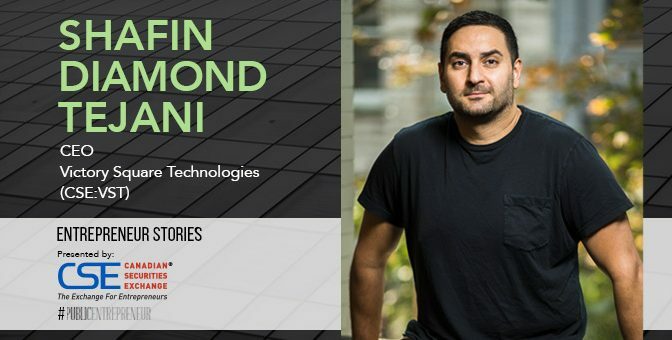 Public Entrepreneur visited Victory Square headquarters in Vancouver recently for an in-depth discussion of Tejani’s philosophies and thoughts on where technology is headed. Investors and entrepreneurs alike could learn much from one of the city’s leading lights in technology investing and helping entrepreneurs realize their business and personal goals. Victory Square invests in companies that are shaping the future, and that means you have some precise views on where technology, and the world in general, is going. Can you share that outlook with us? What are you focused on and what do you see for the future that some people might not? Human nature is very predictable, and history is very cyclical. If you look at the past few decades you see very clear patterns. Our focus recently has been on new emerging technologies, which are disrupting established technology and creating completely new industries. We are seeing things like decentralization, artificial intelligence, Internet of Things, and virtual and augmented reality being the next big movements. I started my first company during the early dotcom boom of the mid-1990s. The Internet and the Web democratized access to information and connected people from all over the world. We have seen that impact every walk of our lives on a global scale, and it accelerated further with the explosion of mobile phones and smartphones. We can now say that humankind is almost entirely connected. Humans generally want to do the same things. On the Internet they want to access information, purchase things, play games and watch movies. They also use social media to connect and communicate with one another. But for the last 25 years, most of these activities have taken place on centralized servers. Facebook allows you and I to communicate but it’s a centralized platform. We input the information, but they own that input, and they monetize it to third-party advertisers without us getting a cut of the money. The impact of global platforms like Google, Twitter, and Facebook leads to problems ranging from the threat of government-ordered censorship to more subtle, algorithmic biases in the curation of material that users consume. These platforms which host and inform our connected public perspectives are unelected, unaccountable, and often difficult to oversee or audit. We are now living through a new movement to create technologies and services to address these issues. Decentralized technologies that are open source, enabling peer-to-peer interactions in lieu of mediated centralized platforms are the remedy to our current global landscape. In a centralized system, everything is kept in the same place and can be hacked. In a decentralized network there may still be a Facebook that can create the network, but we all own our own information and we all participate and benefit from how successful that network becomes. People will want to do the same things, but the underlying architecture is going to be different. From an innovation standpoint, Victory Square focuses on things we know. We like verticals that are commercial and virtually recession-proof. Sports betting is a good example. Let’s vector in a little closer. How do you choose companies to invest in based on your broader view for the future of the world? Given that we begin by focusing on verticals we know well, the next thing we do is identify a large customer with a pain point. Then we look at some 80 accelerators we have relationships with around the world to see what problems talented people are trying to solve. We can bring teams to Canada to evaluate them if they are overseas. The evaluation will take place over anywhere from three to six months, and by bringing entrepreneurs to Canada there are a number of programs we can take advantage of that help to mitigate our risk. We focus on verticals that we have a strong track record and experience in, identify a large customer in that vertical, look wide globally to find the best talent, bring it to Canada to give it all of the advantages of being based in Canada, and then we are able to evaluate the tech and the team as they validate with that large customer we have brought them to. Tech has been commoditized, so it’s your ability to have an operator who can execute efficiently. Execution becomes the real key. We look for strong teams and leaders who have built a product that customers are willing to pay for. And given that commoditization, you need differentiating factors – someone who can speak well and articulate what they are really doing, and then there is that work ethic and hustle that we also look for in an operator. Give us an example of an investment and the impact it stands to have on the future. There are 19 companies in our portfolio doing exceptional things. One of those is FansUnite, which was founded by an accountant and a lawyer who are very passionate about sports betting. We acquired the company about 18 months ago for $2 million, worked with them to build a unique product, and they just oversubscribed a financing of $4.45 million at a pre-money valuation of $13 million. FansUnite is aiming to go public in early 2019. In the sports betting industry, all bettors are generally betting against the house. You are trusting the house to manage the lines appropriately, trusting them to put the player funds in escrow, and then to pay you out accordingly when the time comes. Paying exorbitant fees and trusting a centralized third party with your funds was what led to FansUnite incorporating blockchain into their business. A main pain point is that the house is using a third party to process payments, which means they must charge a fee, and it can be as high as 10%. That means if you bet $100, only $90 is actually going into the pool, so you have to win 54% of the time just to break even. They realized that decentralization and blockchain could address this and built their own protocol and currency. FansUnite will become one of the first companies to build the infrastructure that allows any operator to build a blockchain based sports betting application on the protocol. FansUnite is building the first decentralized application which will be a low-margin sportsbook, taking the fees per bet down to an industry low 1% margin for the book. There are many other efficiency benefits as FansUnite aims to change the landscape of the sports betting industry. Your company materials suggest giving back to the community is important to Victory Square. How does investing in things that make the world a better place fit into the structure of a capitalist enterprise? My family is from East Africa, and in the early 1970s there was a military coup and we ended up in Canada. We basically won the lottery by landing in Canada, where we had access to good education, stable government, safety and security. The advantage we had in Canada and the thankfulness is tied into a responsibility I have always felt, and it has trickled down to our portfolio companies in the form of something we call TKM: Time, Knowledge and Money. There are some in our team who might not have financial resources to give, but they have time and knowledge. A graphic designer might donate design services to a philanthropic organization in need of that skill. Lawyers or accountants can provide legal advice or business planning for charities. Our focus at Victory Square is on vulnerable children and making sure they have the basics, which means access to nutritious food, education, safe environments, love and support. We found that not only do we have the time and capacity to do it as a capitalist enterprise, but if often benefits us because it aligns us with the interests of other socially minded entrepreneurs. There is no negative impact – it is only positive. There is no typical day for you, but how about a typical week or month? Give us a look inside the world of a manager at the top of an investment organization. What are your biggest challenges and how do you keep on top of all the moving parts? I am fortunate to have an amazing team and we divide and conquer. If we take September as an example, we are hosting a conference in London called the World Blockchain Forum, where investors, thought leaders and emerging tech companies from all over the world will be gathering, including some of our own. We’ll be connecting with investors and accessing deal flow in the UK. Right after that we head to Asia, where we have some portfolio companies. We will be stopping in China, Hong Kong, South Korea, Japan, and then we end in Singapore. Thankfully, Asia is a day ahead because we come straight back to Vancouver for conferences, one of which is Cambridge House’s Extraordinary Future, which we sponsor and are actively involved in, and then the AR/VR Global Summit. At the end of September, we are in Malta for the Malta Blockchain Summit. Portfolio companies are global, events we host and speak at are global, our talent pool and investors are global, so we are spread out. And alongside all of that, we are managing our portfolio companies and day to day responsibilities, so we have to ensure we have a really organized team, but also a really deep and hard-working team so we can successfully execute on everything. And there are also lots of activities we run on the philanthropic side – educational programs, food drives, golf tournaments, galas and other events. That initiative is important to us and we have a team that makes sure we devote appropriate time. Victory Square must have a shareholder group a little different than that of the average public company. Can you discuss the type of investor that backs you? We attract a wide variety because we are in many different verticals. We have exposure to artificial intelligence and machine learning, to VR/AR and blockchain, as well as mobile games and film. They fall into three categories: institutional investors who have a longer vision, retail investors who don’t fully understand the sector but want exposure, and then there is a big group of investors who support our portfolio companies from the global crypto community. Given that tech is borderless, we are seeing investor interest from all over the world. If you could convey just one lesson to a talented, budding entrepreneur, what would you tell them? There are lots of things I think are key, but forced to make a shortlist, I’d offer an analogy. If we needed to go to Florida we could get in a car and start driving, but we might not have enough food or money or gas. We might eventually make it to Florida, but it would not be the most efficient way. A well considered plan is one of the biggest things. You need a roadmap for where you want to go. But you also have to realize that the direction you initially started out on might not work, so you have to be flexible and adjust. The entrepreneurial journey does not always look like a hockey-stick curve. It can be very volatile, and having that plan enables you to be better prepared to face the challenges and difficult periods and be persistent and determined to get past it, rather than become frazzled and quitting early. You also need the right attributes, such as strong work ethic, leadership skills, passion and determination. If you put enough smart people together with a good idea or opportunity, you are going to figure it out. This story was originally published at www.proactiveinvestors.com on September 19, 2018 and featured in The Public Entrepreneur magazine. Learn more about Victory Square at http://www.victorysquare.com and on the CSE website at https://thecse.com/en/listings/technology/victory-square-technologies-inc.
Blockchain is an ingenious invention. That much is clear. It’s distributed. Permissioned. Immutable. It has the potential to be one of the most disruptive forces in business in decades. Momentum is strong and changes are moving at a rapid pace. But how can blockchain actually be used in the future? Who is moving the space forward? Will the promise of it all be delivered? Public Entrepreneur spoke to three executives who are leaders in pushing the space forward. Kate Hiscox, Founder, Venzee Technologies Inc.
Tell me a bit about your background. How did you get involved in this sector? SA: I am Executive Chairman of Blockchain Intelligence Group having gotten my start with mining cryptocurrency in 2012. Since that time, we’ve done a number of things in the bitcoin space: industrial bitcoin mining (for clients), and built out cryptocurrency technologies and bitcoin mining pool software. At the tail end of 2014, we started work on leveraging our knowledge of search/analytics as it applies to bitcoin. In 2015, we formulated our company, which focuses on cryptocurrency-agnostic search and analytics solutions. DS: I’ve been involved in the space since 2014, starting with working with friends doing mining out of a garage, and looking at models like a crypto-funded blockchain accelerator, and enabling rent payments with cryptocurrencies. It was quite early and we realized that the market was not quite there yet. I got heavily involved in working with data systems and integration, focusing on enterprise applications in things like health care. 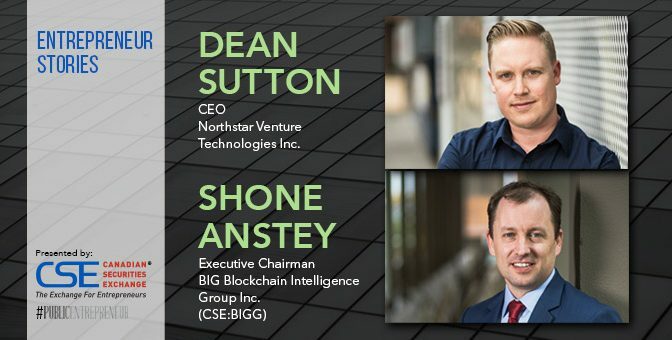 In 2017, BlockTech Ventures, now Northstar, was formally established to focus on the development, integration and commercialization of the core technology into existing markets. KS: I’m a self-taught software engineer. I started coding many years ago and I’ve always had a fascination with technology. As bitcoin started to come into play in 2011/2012, that’s where it became very interesting. Probably about five years ago is when I understood the impact of what blockchain was really going to look like. For Venzee, we started looking at this in 2016. We focused more on what was the threat or the opportunity to our business and we realized quickly that our software was positioned perfectly. What is blockchain and why is it important to the future? Explain it to me like I’m your grandmother. KH: At Venzee, we see blockchain as networks that are just a different type of database in our world. For me, blockchain isn’t actually new, it’s based on an architecture that’s been around for many, many years. It’s great to see it now being applied in a way that’s safer for accountability and transparency. SA: We’re really focused on cryptocurrencies, in our case bitcoin, which we call the public blockchain. So, we don’t say: what is blockchain? We say: what is bitcoin? It’s a new trust layer of the Internet itself which you can think of as layer 8 to the 7-layer OSI stack. This is the missing component to the Internet that has not been available since its inception 30 years ago. Bitcoin is blockchain, blockchain is bitcoin. The two are connected in ways you cannot separate. DS: It’s a core foundational technology, like the Internet, that holds all data in an open ledger that cannot be altered and allows for frictionless peer-to-peer transactions of value, replacing the costs and intermediaries that are commonplace in business and finance. It’s important because of what it can enable, but it takes time for technology to be understood and then adopted. In the future, without knowing it, you and the businesses and platforms you use on a daily basis will be functioning with this technology in one form or another. How is the market for blockchain solutions doing? IBM has a big unit and there are lots of smaller companies with various solutions. DS: The market for blockchain solutions is immense and global and is the key area of focus for Northstar. The reason is, industry knows the technology holds immense value. The challenge is in identifying the opportunities, then being able to build, test and integrate the new technology into existing systems. Commonly, companies are engaging with Ethereum, IBM’s blockchain protocol, or Hyperledger (Linux Foundation). If you look at who is engaging with the technology in a meaningful way, from the Fortune 500 level it’s easier to create a short list of the companies not engaging with it than to describe who is. This is increasing at an incredible pace. SA: It’s still early. IBM is one company leading the charge. I don’t think we’ve quite seen who has the mantel yet, but I do believe the open-source movement will lead it. In your view, what will the market respond to in the next year? SA: I think you’ll see more majors moving into the pure cryptocurrency market. Companies like ours will help them get through the anti-money-laundering compliance issues. When you look at the amount of money these cryptocurrency exchanges are making, it’s a given. Companies have to play in this field or they will lose their edge. That fact is clear. KH: At Venzee, we work with a range of clients, from huge retailers (Walmart, New Balance) on down. We’re having a lot of conversations about how blockchain is definitely of interest on an enterprise level. The industry is really starting to think about it — not necessarily implementing it — but they are finding that they are going to have a strategy or a use for this within the next three to five years. DS: In the next year, we will see continued adoption, understanding, and the market generally understand more about the technology and what it means for industry. Less hype and initial euphoria, and more examples and use cases we can refer to. The technology itself will continue to advance, as it needs to, and we’ll see things like regulation that will come in and really bolster new innovation and capital markets participation in a whole new way. The industry went through a profile and funding frenzy in the latter part of 2017 but has since gone relatively quiet. What takes us out of the quiet period? DS: Further to what I just mentioned; reality, regulation, understanding and a simple precedent for what the technology is doing in the real world. All new technology has this initial “innovation trigger” followed by speculation, and a pullback. That’s where we are, and what was needed. Now we’re in a very exciting time where the tree has been shaken, and the market is in a place to allow for sustainable and pragmatic growth based on more factors than speculation. SA: Technology is taking a bit of time, which makes sense, particularly when you’re dealing with cutting-edge technology. There’s only value in solving difficult issues. If you’re looking to do something that’s never been done before it will take you three times as long and three times the cost. People don’t understand the mechanics of how everything is being built. From a fundamental standpoint, a lot will change and certainly, from a market standpoint, more money is going to come in, but regardless, the technology and the network is growing and people will continue to latch onto it. I know I’ve missed something. What have I missed? What are you excited about? KH: In terms of Canada, I think it’s great to see the CSE moving up and paying attention to blockchain. Canada has the potential to really be a leader in the space. I was talking to someone recently that out of the 15 known cryptocurrency billionaires in the world, five of them are Canadian. That’s incredible. A lot of that innovation is coming out of Canada and we’ve got an opportunity here as a country to grab onto this industry and move it forward. DS: We’re excited for a number of things. We’re excited to see this technology continue to evolve and advance, making its way into the businesses and platforms we all use. We’re excited to see baseless ICOs (Initial Coin Offerings) disappear into memory. For regulation, which will open up this new asset class, namely securities tokens (real equity, real assets) to the capital markets in a way never before done. To continue building real solutions for industry, helping advance the sector at large. SA: Investors want to be able to draw the line between “what’s this technology” to actual real-world use cases. The CSE has been doing a ton of work on this and I think investors are going to be able to wrap their heads around this soon. That’s starting to come. The foundations are being laid. So, what will the next era bring? It creates an incredible opportunity for investors and for entrepreneurs as the new era marches forward. This story was featured in The Public Entrepreneur magazine. The cannabis market is full of potential and creativity, with companies introducing new and innovative products every day. Dispensaries have gone way beyond smokable marijuana, offering customers everything from cannabis-infused edibles like beer and chocolate to personal care products like lotion and eye creams. But the cannabis market isn’t all fun and games. Canntab Therapeutics Ltd. (CSE:PILL) is looking to fill a need in the pharmaceutical space. Based in Ontario, the company was founded by pharmaceutical industry professionals. 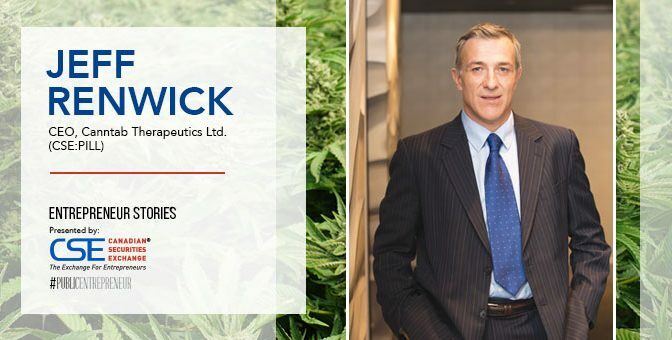 Chief Executive Officer Jeff Renwick was the former CEO of Orbus Pharma Inc., a generic drug developer and manufacturer. Prior to that, he was at Indukern Chemie AG, a Swiss pharmaceutical company. Although once a private company, Canntab merged with Telferscot Resources on April 20, 2017 — a date synonymous with marijuana. Exactly one year later, the company went public on the unofficial pot holiday. The company is presumably the first to offer medical marijuana in pill form. The technology behind the pill was licensed from a predecessor firm. Since then, Canntab has filed seven patents for its two products. Approval from Health Canada to proceed with third-party clinical trials is in the works. When a patient smokes marijuana or eats cannabis-infused edibles, it can be difficult to measure exactly how much of the medicinal elements are being delivered. Chief Financial Officer Richard Goldstein also points to the potential danger of cannabis products being created by those without a pharmaceutical background, without GMP, or “Good Manufacturing Practices,” in place. “A lot of it is being made in home kitchens and home basements. They’re not being made in the GMP environment. And yet, the marketplace continues to eat this stuff up. It’s quite scary at a level,” says Goldstein. He recalled a story where the tablets were so poorly pressed that they weren’t able to be dissolved in a patient’s system before exiting. In contrast, the company’s extended-release tablets offer a consistent, stable dose each time and aren’t susceptible to spoiling and converting into other cannabinoid elements when exposed to certain environments like an oil-filled gel capsule would be. “In true pharma, the only time you use a capsule to deliver medication is when you can’t have a tablet for that medication. If you can have a tablet, that is always the first choice,” says Renwick. The tablets are intended to treat a variety of disorders, including Post-Traumatic Stress Disorder and arthritis. They can also act as a pain management and appetite loss drug for patients undergoing cancer treatments. The pill delivery mechanism may also be the first step in reducing the stigma of marijuana by removing the smoking aspect. Renwick recently had a conversation with a landlord who was spending hours in court after tenants complained about neighbors smoking marijuana, some of whom were using it for legal, medicinal purposes. The pill can be a smokeless alternative in areas where smoking isn’t allowed. Canntab believes the pill alternative will also appeal to senior citizens who take multiple pills per day, especially in assisted living facilities where smoking may not be allowed. “They’re not going to smoke. They’re not going to eat gummy bears, but they’ll take a pill if it makes them sleep better,” says Renwick. The company does have a sleeping pill in the works, although clinical trials will still need to be performed. And a future product line may include cannabis tablets intended to specifically treat sleep and social anxiety disorders. While the legal landscape is always evolving from place to place, the company has come to agreements to expand outside of Canada. Canntab is working on import and export permits, with agreements already in place to send tablets to Australia and Germany. Deals with Poland, Spain, and Greece are also being discussed. Moving into the U.S. market is challenging. Recreational marijuana use is already legal in nine states, including California, Washington, Oregon and Nevada. Medicinal marijuana is legal in a total of 29 states, including those West Coast states as well as East Coast states like New York and Delaware. But on the federal level, cannabis is still illegal. “Ultimately, we want to get something going in the US, preferably in California,” says Renwick. The company has said it has a “soft plan” to get there by perhaps 2019. A lawyer is looking into licensing in California on its behalf. A 2017 Gallup poll found that 64% of Americans support the legalization of marijuana. Looking to the future, Canntab’s CFO is confident that the company is in good financial shape. Goldstein notes that the company’s immediate cash needs have been fulfilled after going public. “The good news is that we have lots of money to do what we want to do in the short term and then as opportunities present themselves, we’ll seek capital if necessary,” says Goldstein. Learn more about Canntab Therapeutics Limited at http://canntab.ca/ and on the CSE website at http://thecse.com/en/listings/life-sciences/canntab-therapeutics-limited. With hundreds of cannabis companies popping up over the past few years, it is perhaps unsurprising to see some consolidation in what, right now, is a very hot sector. Cannabis – or weed or pot or whatever you want to call it – was, for a long time, looked down upon by many members of society who thought of it as a drug for slackers and spotty teenagers. That image has certainly started to change as an increasing bank of research suggests cannabis – or more specifically the stuff in it – has a number of positive uses, including as a treatment for things like stress and chronic pain. Lots of companies have emerged to try to get a piece of this lucrative pie – some analysts think it will be worth US$180 billion within just a few decades – which has created a very fragmented market made up of small firms which don’t always have the experience or the resources to thrive. That’s where Cannex Capital Group (CSE:CNNX) comes in. The company joined the Canadian Securities Exchange in March, raising US$48 million from investors, including some “blue-chip institutions”, in the process. Cannex accelerates business growth for small, revenue-generating companies by acquiring them and giving them the support, both financially and managerially, to grow into sustainable, large-scale businesses. “There are lots of companies in the cannabis sector that are just starting off and many of them are going to fail because they don’t know how to operate a business at scale,” says Chief Executive Officer Anthony Dutton. The ‘we’ Dutton refers to is himself and his two main operating partners from Washington State; Cannex Chief Operating Officer and Director Leo Gontmakher and Director Jerry Derevyanny, who is also Cannex’s Executive Vice President of Corporate Development. Having worked in the corporate finance business for the better part of 25 years, Dutton brings solid financial experience to the operation, but as he openly admits, wherever he has been he has always had a solid operating team – in this case Gontmakher and Derevyanny. The duo formed the top brass at BrightLeaf, a cannabis holding company which was acquired by Cannex for US$36 million as part of Cannex’s initial public offering in March and is the firm’s foundation asset. BrightLeaf’s strategic operating tenant is Northwest Cannabis Solutions – the biggest grower and processor of cannabis in Washington State. NWCS has a couple of manufacturing facilities where it grows “premium” cannabis, some of which it uses for its own derivative products (more on those later) and the rest it sells on to retailers under the ‘Private Reserve,’ ‘Legends,’ and ‘Funky Monkey’ brand names. While NWCS is the largest cultivator in Washington, it also purchases significant quantities of trim and full flower cannabis from third-party growers, which, along with some of its own trim, it extracts and processes into two types of extract: tetrahydrocannabinol (THC), which is the active substance to create the “high” feeling of marijuana, and cannabidiol (CBD) distillate. “We [then] refine it and infuse it into what are called derivative products – so everything from creams to vape pens to chocolates to candies,” says Dutton. That’s the main arm of NWCS’s operations: extracting the oils from the plant and then using it to create a range of infused products. NWCS has a host of brands including Magic Kitchen (edibles) and Evergreen (vaping cartridges), in addition to its aforementioned cannabis flower labels. “We’re very focused on quality, so we have to focus on brand; brands are very important,” said Dutton. It is perhaps no surprise, then, that the second company to join the Cannex stable – Jetty Extracts, which was acquired in April for US$22.5 million – is also home to some popular brands in California that have a loyal following. Jetty is significant because it takes Cannex into the Californian market – comfortably the biggest in the US. By 2020, it is estimated that the state will be raking in more than US$1 billion a year in cannabis taxes alone. That isn’t enough to satisfy the ambitious Dutton though, who has grand plans to take Cannex across the United States and around the globe in the not-too-distant future. “We’re already in two states and by the end of this year I want to be in two more US states and one foreign country,” he proclaims. Acquisitions in the booming cannabis industry are unlikely to come cheap, but Dutton isn’t too concerned about this for now. Cannex has US$15 million in the bank and is already cash-generative, so he says there is no need to raise money in the immediate future. He is acutely aware that at some point, though, he will have to go back to the markets to fund the kind of rapid growth he wants, but he doesn’t expect it will be a challenge to find people willing to back him with their cash. 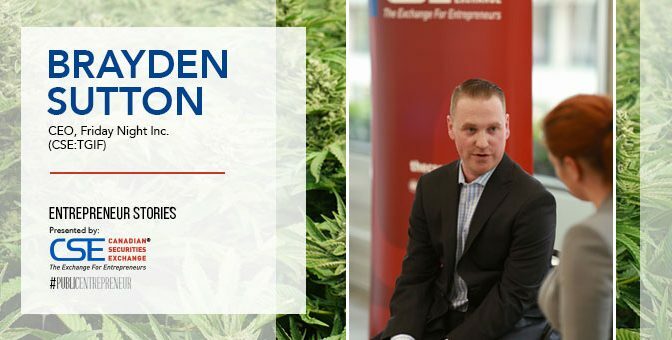 Learn more about Cannex Capital Holdings Inc.at http://www.cannexcapital.com/ and on the CSE website at http://thecse.com/en/listings/life-sciences/cannex-capital-holdings-inc.
Brayden Sutton is one of the pioneers of the modern Canadian cannabis industry and is also fast becoming an authority on the business in the United States, where he believes resources are currently better deployed in most cases. Public Entrepreneur spoke with Sutton, Chief Executive Officer of Friday Night Inc. (CSE:TGIF), recently about the different outlooks for the two markets. We’ll get into the US regulatory environment around cannabis and your opinions on cannabis stocks in a moment, but first can you explain what Friday Night does and why you chose the US market as your focus? Friday Night’s primary asset is the very first cultivation license for cannabis in Las Vegas. We bought this asset early in 2017 and took it public in June of that year. It was July when things went recreational, and since then we’ve experienced very good growth. It was all a function of making sure we were ahead of the trends, not chasing them. I’ve always been one to go where the puck is going to be, not to follow others. I was a first mover on the investment banking side of the cannabis space with my own capital in 2013, and then in cultivation and later in various forms of extraction and processing. I have been fortunate to be able to get in front of trends and I knew that Las Vegas was going to be a great market to be in. One staggering statistic is that the US cannabis market is estimated to be over $75 billion, and yet not one group controls even 1% of that market. Now that is the opportunity of a lifetime for investors. I was personally invested over 10 years ago in the Canadian cannabis industry, as the MMAR (Medical Marihuana Access Regulations) eventually gave way to the MMPR (Marihuana for Medical Purposes Regulations), and I co-founded Supreme Pharmaceuticals in early 2014. I began to feel that from 2014 to 2017 things had become stretched on the Canadian side. Canada has a very limited market in all aspects. Despite it leading the world in capital for cannabis initiatives, there are only about 7 million cannabis users coast to coast, so it is a tiny market versus a state such as California or somewhere such as Las Vegas, regardless of whether you are talking adult use or medical. I know the company has holdings in businesses outside cultivation. Can you talk about those as well? We own 91% of a company called Infused Manufacturing, which operates as Cannahemp, and they are solely a hemp-derived CBD business. It doesn’t come with the same restrictions and the products appeal to a much broader base. From tinctures and creams to bath bombs and lip balms – there is a very impressive list of products that apply to far more people than cannabis does on its own. More recently we have acquired Spire Secure Logistics, a Canadian company focused on due diligence and security in the cannabis sector. That branches us into exposure to Canada and once again a growing trend – there is a major lack of discussion around infiltration of organized crime, diversion of product, internal theft of product, products making it into stores when they should not be there, and many, many other issues. It gives us a magnifying glass into the operators we are considering and the ones we have in terms of ensuring we are only working with top-notch business people who put shareholders first – and as important, don’t bring with them any negative history. What are some of the unique aspects of operating in the US market and how do you make the most of them? One big one is the opportunity today. With Canada, everyone took at face value Prime Minister Trudeau’s promise of legalization by July, which will not happen. It remains to be seen if it will even happen this year. If you go south of the border, however, you’ve still got many federal catalysts to come. I would argue that Canada has had its primary growth in the space already from 2013 through 2017 as far as investment is concerned. Now it’s all about market share and who will ultimately shake out as the “Big 5” to serve a recreational market and a much less fragmented medical market. It is much like when people buy a stock on the rumour and sell when the news comes out. In Canada, I feel if cannabis were to become legal tomorrow a lot of people would sell on that catalyst and look for the next big thing. That’s the nature of venture capital; it gets bored easily and needs new opportunities and to blaze new trails. Just recently there was a conversation between President Trump and the Governor of Colorado, which sent US cannabis stocks higher. There is so much to look forward to and I really see America today much like Canada was in 2013 in terms of the financial opportunity that exists right now. It has years of accelerated growth ahead, and as people wonder if they have seen the peak, it just continues to get bigger, as it did in Canada for the last five years. As far as operating in the US, I have enjoyed it and our partners municipally and locally are far better to deal with than Health Canada in every way. There is much more of an entrepreneurial mindset in the US. It’s just a lot more enjoyable of an environment, and people seem to be more accommodating to this business, be it construction companies or bankers, they all seem to be happier to have the business. My experience in Canada was people were more hesitant and unsure of the muddy legal landscape. In Nevada, it’s black and white. Observers are aware of the conflicting positions of US state governments and the federal government. How does that environment get reflected in your corporate strategy? What if the United States suddenly voted on a rescheduling of cannabis this year or next? Something to consider. Big Pharma spends more money lobbying than any other industry in the US, by far. Big Pharma has an interest in not missing the boat. Just take Merck, Ely Lilly and Pfizer as examples. Think of the money they are losing every day because this drug is Schedule 1 (no currently accepted medical use in treatment) and not Schedule 2 (has a currently accepted medical use). There is going to be a major push from them and it is already happening behind the scenes. I continue to be of the opinion that we may see more federal catalysts in the US before we do in Canada and for that reason as a company we are very much focused on Nevada and we are fairly confident in an overall softening on the Federal stance, allowing the sector to mature further. So to answer your question, on a state versus federal level we very much enjoy where we are and are perfectly happy to paint within the lines of the state. One thing I admire very much about the US is the Tenth Amendment and individual states’ rights, and with that we are very confident in our strategy that we will be able to take full advantage federally, once able to do so. What is the difference between doing business in the various states? Why would you choose one jurisdiction over another? Nevada has been extraordinarily regulated for decades, and it has to be for things like gambling. Compare Nevada to other states; Washington has thousands of cultivation licenses, as does California, as does Oregon, as does Colorado. Nevada has less than 200. Colorado legalized the plant in 2014 and the cartels involved in trafficking cannabis moved back into the state because there was an economic point at which they could still be in business. So the state was forced to lower taxation by a couple of dollars per gram and immediately the economics shifted for organized crime and they left. Nevada was forward-looking in saying they want to ensure illegal players are pushed out and that their new licensees are not going to be underwater in 12 months. I would point to Canada again, where we have over $15 billion of market cap making up the public companies in the space, never mind the private ones, and they are fighting over a total market share of only about $200 million a year in business right now. To me, that represents a bubble in the truest sense. Yes, legalization will launch that number to more like $5 billion-plus, but legalization is not guaranteed. Look at Nevada versus Canada, Canada probably has 50 times the square footage in terms of canopy space and it has perhaps a fifth of the user base. It is just back of the napkin math. If Canada flicked a switch tomorrow and said it was legal tomorrow, what are they going to do with the surplus product? Export to Europe? In one or two years Germany, Australia and other countries will be caught up and won’t want or need imported weed. Canada will not be important at that point from a global supply standpoint. I still scratch my head and wonder why there are millions of square feet of canopy on the way for a country as small as ours. Particularly when THC will more than likely eventually come from a petri dish, not a flower pot as the trend moves further and further from the combustion of flower to get THC in your body. From an investor standpoint, anyone owning US assets in any form needs to have a far greater risk profile than one owning only assets in Canada. The general consensus could be said that Canada is safer, but has far more downside than upside, whereas the US is far riskier, but brings much higher upside potential. Tell us about the feedback you get from investors and financial professionals on the cannabis sector and Friday Night in particular. Investors are always hungry for the next thing to get excited about – the next catalyst. We have always been focused on revenue and profit. We are currently at a run rate of well over $10 million a year, which I think is notable in less than 12 months of being in business. Shareholders are very picky nowadays and they demand perfection, as they should. But there is no such thing as a perfect company, so all we can do is our best. And right now I would say we are extremely pleased at our progress to date as well as our trajectory and future prospects. We are always looking to improve. We are looking at vertical integration, and right now we are looking at owning a strong retail presence, so that is taking a lot of my time, to determine what the best course of action is regarding final sale of the product. Once we are fully vertically integrated we can be exposed to that seed-to-sale margin that so many others enjoy. There are certain things that are hard to invest in. I am not going to spend CDN$25 million on 20,000 square feet which is the going rate on a Canadian ACMPR grow, when I could spend US$5 million and buy something that is already doing a million dollars a month in sales. On the banking side and institutional side, they are more pragmatic and see things on a numbers basis. What is our maximum funded capacity, what is the maximum money we can make relative to our current market cap if everything goes as planned, and where would we be in the worst-case scenario? Shareholders tend to be younger, more astute and better educated, but since there is so much misinformation out there, they are looking at it as more of a land grab, which is not the way to look at it. You want to consider if a company is sustainable and profitable many years out, and what they are spending today to get there. We are generating a million a month and moving towards profitability. All we can do is block out the noise, build value and continue to do what we’re doing. I see a lot of companies buying smaller companies for the sake of owning more companies, mostly due to investors and I think that’s a dangerous strategy long-term. Any other thoughts you want to leave us with? I have been an investor for 14 years. When you hold a stock, if you hold XYZ company, you should ask yourself every night when you go to bed if the state or country I am in goes legal, how will I do? If it does not go legal, how will I do? If there is an influx of competitors, how will I do? If key management leaves, how will I do? Just make sure you check all those boxes. If 30 months from now nobody is buying flower, will this company survive? When Merck and Eli Lilly and Pfizer step into the scene, they could literally make this plant obsolete within decades. What I mean by that is that a tiny fraction of the world rolls cannabis and smokes it. But, for example, if and when a 50mg THC/CBD capsule is made for 10 cents in a lab and sold for $5, good luck to the company growing $2 grams and selling it at $6. So, just make sure that whatever stock you hold does not have any one lynchpin. Know what will happen to that share price in any environment. If someone came along who was stronger and better than me, I would be gone in a heartbeat. I am not a lynchpin for this company. If I ceased to exist tomorrow, the company would still flourish. Those are the type of companies you want to own. Learn more about Friday Night Inc. at http://fridaynightinc.com/ and on the CSE website at http://thecse.com/en/listings/diversified-industries/friday-night-inc.
Sunniva Inc. (CSE:SNN) Chairman and Chief Executive Officer Dr. Anthony Holler remembers well a lesson from his success building ID Biomedical, a vaccine manufacturer acquired by British pharmaceutical giant GlaxoSmithKline: produce at low cost, at a high level of quality, and at scale. These guidelines play an important role at Sunniva, which is moving quickly to initiate production of cannabis at facilities in both Canada and the United States. Dr. Holler offered insight on the company’s marketing and risk management strategies in a recent telephone discussion with Public Entrepreneur. Sunniva is progressing toward large-scale cannabis cultivation in both the United States and Canada. Let’s start by reviewing your basic business approach. Sunniva is focused on the two largest cannabis markets in the world – Canada and California. Our concept involves large-scale, high-technology facilities in a greenhouse format. That means we can be a low-cost producer, also producing at the highest quality and at scale. Our facilities, when fully completed and operational, will produce about 100,000kg of dried cannabis per year in each location. Pre-selling a significant portion of our production is also an important pillar of the business plan. We have announced that in Canada we have pre-sold 90,000kg of dry cannabis to Canopy Growth. The idea is to de-risk our business model. In Canada, we also plan to grow the Sunniva brand through our specialty cannabis clinics, where we have about 95,000 patients registered with Health Canada. And as that number builds we expect that some of those patients will be taking a Sunniva-branded product. We are primarily focused on the medicinal market. Importantly, our facilities meet GMP (Good Manufacturing Practice) standards, so we will be producing pharmaceutical-grade products. Can you give us timelines to production on each side of the border? We’ll start commercial production in California probably in the third quarter of 2018, which means we have the potential to harvest our first crop by year-end. After that we scale up the facility over a period of about eight or nine months. By the end of 2019, we should be in full production on our initial Phase 1 in California, that will produce about 60,000kg. And I’d see us starting on Phase 2 almost immediately after Phase 1 is completed. In Canada, we are just breaking ground right now, and construction is expected to take eight months. At the earliest, production will start in the first quarter of 2019. And similarly, it would take eight or nine months to get to full scale. My estimate is that Canada reaches full production in 2020. Take us back to your initial decision to produce in the United States and how you first recognized the opportunity. What has been required to develop the business to its current status? In California we saw a very large opportunity and we travelled throughout the state looking at lots of facilities. Our conclusion was that California was about five years behind Canada. It is a very fragmented industry with many small growers, lots of dispensaries, and, at that time, no regulation. We realized that regulation would be coming, both legalization for adult use as well as medicinal cannabis. This meant a couple of things. The first is that quality of product would become important, and the second was that there would be a scarcity of safe products that would meet California laws once they were enacted. That is why we decided to build this 500,000 square foot high-technology facility for growing cannabis. Things have been moving along quite quickly. We now have all of our temporary licenses in California that allow us to be compliant with California law. And recently you saw that the Trump administration is basically saying that they will let the states regulate their use of cannabis and the federal government will not interfere with that as long as they are not breaking federal laws through such activities as exporting across state lines. Looking ahead we are preparing for what is called annual licensing. At the end of the day you need annual licensing to be compliant in California. The state decided it would be a two-step process. It would start with temporary licensing so they could get compliant production and sales going. A lot of people have not done that, so they are going to be offside with California laws. You are going big into production in both the US and Canada, and the countries have two very different operating environments. Can you give us some insight into those differences? In the US, everything has to be done within the state – you cannot ship product out of state, you cannot export it to other countries. You have to grow and sell everything right in California, in our case, and the other states are like that as well. In Canada, you can ship your product across the country, and if it is GMP-compliant you can ship it to the European Union. The other difference is that in Canada there is clear delineation between medical use and adult use. Licensed producers can deal directly with medical patients, whereas adult-use will go through provincial authorities and they will regulate provincially. Can you walk us through the business components generating your revenue right now? Currently, our revenue comes from two areas. One is our device company, FSD. They produce vaporizers and cartridges. Smoking of cannabis is becoming less common and use of vaporizers and other devices is becoming more common. And our entry into this business was strategic, as we saw it being more valuable once we are producing cannabis ourselves. The business currently sells empty devices to a variety of brands across the US. It is a relatively low-margin business, but it is profitable and brings us significant revenue. The real opportunity for us is that once we are producing our own oils and other products, we can go to the customer and offer not only to sell the cartridge and pens, but a loaded cartridge with the component of oil you want. If someone wants a high-THC oil we can do that, or if they want pure-CBD oil we can do that. The high value part of the business is filling the device, packaging it and then giving it to the brand. That was our strategy right from the start. What’s happening in California is that a lot of the brands just want to be marketers and sellers, but they need a reliable source of flower, oils and devices. We fit that niche for them. The other component of our cash flows are natural health services, which have seven clinics across Canada. We have doctors, nurses and highly educated helpers who take care of patients when they come to our clinics. The doctor will make recommendations, we educate the patient, and then we connect with a licensed producer from which they can buy their cannabis. The business generates healthy revenue already, and we generate revenue through licensed producers – we have 25 signed up to our software package. We get paid based on their use of the software. It allows the doctor and our clinic to communicate directly to the producer, so patients can literally get their delivery a day later. It automates the whole ordering system. And when we are in production, some of those patients will be using Sunniva-branded products. Let’s look at the financial market side of things. How are investors and financial professionals reacting to your story? What we hear from analysts is they like the approach of de-risking the business by forward-selling the product. The question in investors’ eyes is that it is great companies can produce cannabis and dry product and oil, but can they sell it? Where is the market going in terms of pricing? Our view is that if we can lock in some pricing on the sale of a majority of our production, it safeguards the whole business strategy. The fact we are selling pharmaceutical-grade product also means we can sell it in Canada, or we can sell it internationally. And the fact that we are a grower at scale of high-quality cannabis, that’s what people like. Can you tell us what your competitive advantages are beyond the strategy you have laid out so far? Sophisticated management. My background is from the pharmaceutical industry. I was a founder of a company called ID Biomedical and that was purchased by Glaxo Smith Kline for a total of about $2 billion. We built one of the largest flu vaccine manufacturing facilities in Quebec City. We produced at low cost, high quality and at scale. We could then go to the big distributors and ask them how much they wanted. We pre-sold about 40 million doses in the US and supplied about 75% of the Canadian marketplace. We have those types of people in our company who went through that. Similarly, our CFO was the finance person for Lululemon as it went from $150 million in sales to $1.5 billion in sales and became a $12 billion market cap company. One of our big advantages is that people look at our team and see that we have executed on a number of very significant companies, and expect that we should be able to do it again. Are there any closing thoughts you would like to offer? We have been judicious with raising capital. We have been able to finance our facility in California through a large developer out of Los Angeles, Barker Pacific Group. And that has enabled us to not have to raise that $50 million to build that facility. Fully diluted we only have about 40 million shares outstanding, and I think our shareholders appreciate that we are very careful about issuing shares. At some point we will issue more, but we are going to be careful because we don’t want to dilute our shareholders. I also believe our shareholders appreciate that management and board members are significant owners in the company, too. Shareholders see that we are invested and that we need to make this a success for ourselves as well, and then we can all succeed together. Learn more about International Sunniva Inc. at https://www.sunniva.com/ and on the CSE website at http://thecse.com/en/listings/life-sciences/sunniva-inc. It was insights earned from years of hard work and dedication that led Phivida’s senior management team to choose a greater vision. Founded in 2014, Phivida has shifted its focus from a pure-play wholesaler of CBD (cannabidiol) hemp-oil extracts into a premium portfolio of CBD-infused clinical and consumer brands, offered in a variety of formats, and formulated to serve the needs of patients, practitioners, professional athletes, and active professionals. 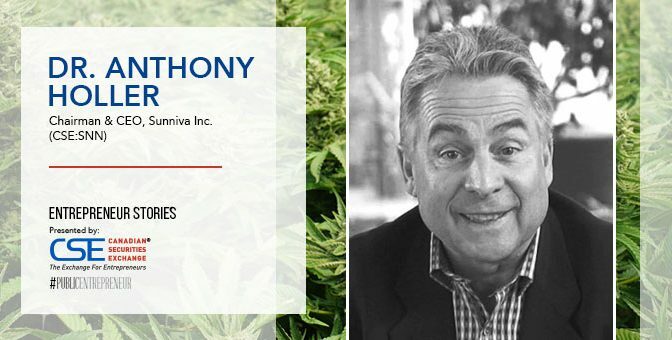 President and Executive Chairman of Phivida Holdings Inc. (CSE: VIDA) John Belfontaine has moved as fast as anyone to take advantage of the growing interest in all things hemp/cannabis, as legalization efforts – and greater acceptance of the plant’s medicinal properties – continue to progress in North America, and around the globe. 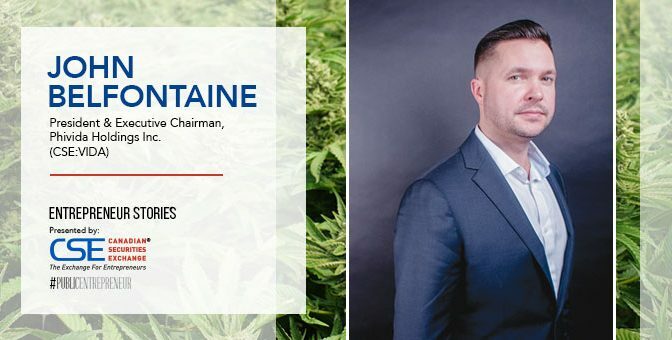 Belfontaine, working with key advisors, first saw the opportunity, brought it to the capital markets and quickly found himself fully capitalized, with an all-star line up of experienced executives. Fast-forward to Q2 2018 and the company has a flush treasury and a newly evolved senior management team with proven success in taking products through regulatory labyrinths – plus a vision to build a CBD brand which appears destined for success. The Phivida executive team now includes Chief Executive Officer Jim Bailey who, with his team, built the energy drink category in Canada from scratch, taking Red Bull Canada to over $150 million in annual sales. Energy drinks such as Red Bull were not even approved for sale in Canada when Bailey agreed to head the Canadian operations of what is now a household name. 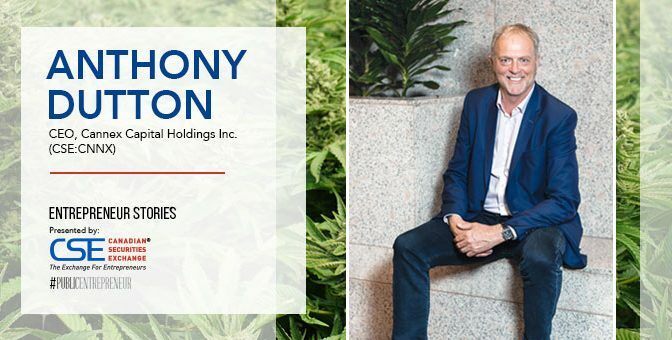 There are clear parallels to his success in that role with the quickly evolving regulatory environment within the global CBD hemp and cannabis industry. Bailey is new to the team, having joined Phivida in mid-March, following the appointment of Michael Cornwell as Chief Marketing Officer. Cornwell’s vast experience in brand marketing and sales for top CPG (Consumer Packaged Goods) companies includes his former role as Business Unit Director for Red Bull. The most recent addition to the executive team is another top Red Bull alumni, former Red Bull USA Director of Sales Doug Campbell. Campbell joined the team in early May in the role of Chief Commercial Officer, now overseeing international distribution and sales. Clearly, Bailey and his new teammates qualify as star power for a company of virtually any size but for one at Phivida’s growth stage their leadership is truly remarkable. Their decision to join was based on a clear potential to grow the company into a leading brand in a product category in which they all share a common passion: functional foods, beverages and natural health products infused with CBD from medicinal hemp. The Phivida product line currently encompasses CBD capsules and tinctures both for consumer and clinical markets, as well an appealing selection of CBD-infused beverage innovations. Phivida’s CBD beverages use encapsulation technologies which make the CBD oils faster acting, longer lasting, and soluble in a fluid format. Perfect for CBD beverages, higher than average consumption rates, and a USA health and wellness market that tends to place a premium on price and convenience. The company is continuing to innovate on new CBD-infused beverage brands and formulations, and the finer details of its marketing strategy, ahead of a USA roll out. As a first order from the new chief executive, the creative vision for the future of the brand is now led by award-winning creative agency Sid Lee. This is the same creative agency that assisted Red Bull’s launch in Canada, as well as other notable names in their portfolio, such as North Face and Grey Goose. Phivida has also engaged world-renowned brand designer Brian Schmitt to act as a creative director in the evolution of the brand, with a portfolio of work that includes global brand juggernauts like Nike and Apple. Bailey came to believe in the potential of cannabinoid-infused products during his recovery from a cycling accident several years ago. The hospital that performed his surgery had him on opiates while under its care, but even before being discharged he was looking for natural alternatives. Both Belfontaine and Campbell share similar stories, and one that many relate to. Bailey says the only way to beat competitors in the current environment is to “out-market them and out-professionalize them.” He explains regional distributors are forced to operate in somewhat of a wild west environment for the time being, often turning to manufacturers making small batches and selling product on the fly. Ensuring reliable supply of high-quality ingredients and at the same time opening a new potential market in Canada is par for the course for Phivida. However, the company’s biggest move to date is one the capital markets have, arguably, yet to fully appreciate. Phivida’s prospective foray into the Canadian cannabis market is through a joint venture agreement with licensed cannabis producer WeedMD (TSXV:WMD) in what would be a co-owned company called Cannabis Beverages Inc., or “CanBev”. WeedMD is fast becoming a major cannabis producer under Canada’s ACMPR (Access to Cannabis for Medical Purposes Regulations), with a 26,000 sq. ft. facility operating with annual production capacity of 1,500 kg of high-quality cannabis. Their second facility has an estimated 33,000 kg of capacity with an option that could take it over 50,000 kg. This 14 acre (609,000 sq. ft.) expansion project in Strathroy Ontario boasts world class genetics, top-tier management and the infrastructure to support large-scale growth, with a low cost of production, by using state-of-the-art greenhouse technologies, yet maintaining premium quality production standards. WeedMD also recently announced a merger agreement with Hiku Brands (CSE:HIKU) which may add recreational THC brands to the CanBev project, as well as west coast licensed production with their ownership of DOJA, and a national network of retail locations for cannabinoid infused products through their ownership in Tokyo Smoke. “Our joint venture with WeedMD is designed to build and operate the first ever federally legal cannabis-infused beverage production facility in Canada,” explains Belfontaine. The CanBev joint venture also enables Phivida to bring their products home to Canada by navigating an important aspect of the Canadian regulatory environment. “Industrial hemp is not an option for us in Canada,” explains Belfontaine in discussing legal sources for the oil Phivida needs to make its products. “The WeedMD partnership provides sufficient supply of high-grade CBD from a legal source. We are partnering with an ACMPR licensed producer to source cannabidiol in Canada, and we are thrilled to joint venture with what we consider to be the ideal partner in the Canadian market. In the US, Phivida products use full spectrum hemp oil extract, with 0% THC, “for all of the health and none of the high,” Belfontaine says. To date, Phivida has focused on the medicinal CBD market and the Phivida brand in Canada will remain true to this ethos. As a complementary partnership, the WeedMD-Hiku collaboration also opens a whole new market to the CanBev project in the adult-use recreational side of the sector. Looking to ensure every possible base is covered, Phivida has its eye on a launch across North America, while preparing for expansion to new and emerging markets overseas. “We have secured distribution partnerships across the western United States, as well as in Japan through Asayake,” says Belfontaine, adding that a deal with Namaste Technologies provides exposure to UK, German and Australian markets via online sales. Phivida has completed two major financings in the past five months, including its long form prospectus IPO in December 2017. The appreciation in share price out of the gate resulted in the company having almost $7 million worth of warrants exercised. In April, they completed another prospectus offering in bought deal which grossed $8 million. 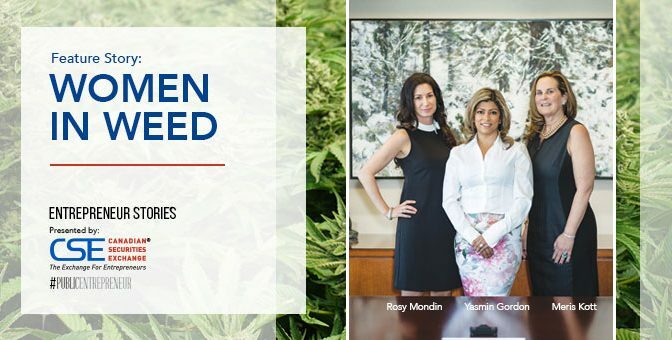 It’s a common story thread: women entrepreneurs blazing the way for cannabis, taking over the sector and inserting themselves into a market that is booming, complicated and fast-evolving. Stop. Back it up. Wait a moment. This is not one of those stories. It’s an easy – perhaps a bit lazy – trend to latch onto, one that weaves itself through the cannabis daily news cycle. “Women in weed: charting change for male-dominated cannabis culture,” blared a CBC headline earlier this year. This is not to say that women aren’t powerhouses in the world of cannabis. They are: just like they are in each and every other sector, when put in positions of power to do so. In order to survive in this sector, you have to have strong chops, a killer resolve and the tenacity to do whatever it takes. It’s that entrepreneurial spirit that is key. Being a woman just happens to be one part of the equation. Proactive Investors spoke to four women who touch different corners of the cannabis industry. From financiers to investment bankers, from equipment manufacturing to recreational advocates, we chatted about their past, predictions and what might roll out ahead. Meris Kott – CEO at Redfund Capital Corp.
Redfund Capital (RFND:future symbol) is a cannabis merchant bank that provides an alternative source of capital through a debt facility to bridge finance and helps revenue producing cannabis related companies build their valuation, and grow their company without diluting their equity prematurely, while helping move them toward being publicly listed. Yasmin Gordon is co-founder of the Gordon Group, as part of Canaccord Genuity Wealth Management, and advises private clients, corporate entities and institutional investors. Quadron Cannatech (QCC) is a market and technology leader in end-to-end automated processing and extraction laboratory solutions for the international cannabis industry. QCC also provides a range of innovative value added services including custom ancillary products and cannabis accessories. Hiku is a cannabis house brand. Hiku’s subsidiaries include Tokyo Smoke, DOJA, Van der Pop and Maïtri. Q: Tell me about how you got into this industry. What led you here? MK: I come from an investment banking family, which funded emerging market growth companies. About 12 years ago, we started looking at the cannabis industry, and we didn’t touch it, figured it wasn’t ever going to happen. We got into the industry in 2012, after Amendment 64 passed in Colorado. We’re now launching the first debt facility merchant bank, Redfund Capital Corp., focused on funding cannabis related revenue producing companies. YG: I am a Senior Investment Advisor with Canaccord Financial, specializing in non-traditional wealth management strategies with a niche in providing financing opportunities. I came into the cannabis sector, quite honestly, out of necessity – I could see there was a shift occurring as we got more clarity with regard to full out legalization in Canada. I saw the opportunity and decided to add exposure in a more significant way. It’s been an exciting ride. RM: As CEO of Quadron Cannatech, and a leading advocate for the legalization of recreational cannabis in Canada, I’m thrilled to be at the forefront of this emerging industry. I’m the director for the Cannabis Trade Alliance of Canada (CTAC) and I also serve as a Special Advisor to the Canadian Association of Medical Cannabis Dispensaries (CAMCD). In my role with CTAC, I work with industry leaders, government legislators and educators to develop an inclusive, safe, and ethical cannabis industry. RK: I’m the vice president of HR at Hiku. Back in 2013, we saw an opportunity in getting into commercial cultivation, so we put in our application. We received our license to sell just this year. It’s been a long road but here we are. We merged with Tokyo Smoke in January. We then just recently merged with WeedMD in a pretty transformational transaction: combining a premium cannabis brand house and retail-focused operator. Q: For some women, this might not be a sector that immediately comes to mind as a place to be. What advice would you give others who may not have considered this sector as a career path? MK: Jump in! Because right now we’re creating a whole new industry. That said, it has changed and it’s become harder to break into the industry as a woman because it’s becoming more mainstream. Women are generally the chief medical officer in their family and looking at cannabis products more closely. I also think because it’s such a new industry people don’t consider it as a career path and it is still a risky avenue for work to some women. RM: We are building a new industry – we currently have just over 100 Licensed Producers across Canada. If you think about most industries, 104 commercial licensees nationally in the sector is not a true industry. We are slowly seeing more ancillary businesses coming into the fold: legal, accounting, marketing, government relations, business development, branding, packaging – and banking (slowly). In addition, the cannabis industry has been operating in an under-regulated space (as there was no other option). Now there’s a lot of opportunity during this transition into the regulated market. There’s just so many areas that you can jump into as we build a whole industry so it’s really up to your own imagination as to which way you want to go and how to get your feet wet. Q: What trends do you expect to see when recreational comes online later this year? RM: I think the biggest shift will be the consumption of cannabis moving away from smoking traditional flower to products that are extract-based. Extracts form the basis for the majority of cannabis products outside of smoking: vapor-oils, capsules, tinctures, sublinguals, transdermal patches, edibles, topicals, suppositories, infused beverages. I have no doubt that we’ll see different consumption methods and further product innovation. I think the sky’s the limit. MK: I’m going to wear my American hat here. I think we’re going to see a huge influx of American companies that have already been working with Canadian companies on many of their products, move more into the market. I think the Americans are going to flood our market with new brands, technologies and licensing agreements, as well as other countries who have approved recreational cannabis already. It can only help create a successful global marketplace. YG: I see a shifting consciousness as to what legalization means for cannabis as many people will be forced to redefine what they know about the potential benefits of cannabis as a therapy option. You know I find it very interesting with my clients. There’s a divide in my book of clients: there are those that are for investment and those that still believe it’s a gateway drug. I believe perceptions will swing more positively as the public receives further education about the medicinal benefits of cannabis. RK: It’s interesting when we talk about recreational. It’s a national movement that’s going to have so many ripples of effect. I’ve always believed that vaping and very clean, efficient methods are going to be preferred. However, we also believe that there’s a segment of the market, maybe 10% or so, that wants a curated strain and they want it in its entirety. It’s similar to going to a winery. You want to talk to a winemaker about how it’s grown, what it looks like, feels, tastes, etc. Q: We’re seeing a lot more mergers and consolidations in the space. How do you differentiate yourself in a crowded market? MK: In Canada, the companies are much smaller than other global players, although they are financed with plenty of capital. That said, you will see more consolidation between U.S. and Canadian companies. It is going to be about a recognized branded product first off. RM: Like any industry, we’ll see consolidation, mergers, acquisitions and we’re going to see some businesses that will not make it – it’s the nature of any business. Look at the restaurant industry. It’s one thing to have a good idea: it’s another thing to actually execute it, using the restaurant example, understanding how to run a kitchen, avoid food-waste, or manage front-of-the-house. There will be consolidation, as licenses get scooped up through mergers. It’s just the normal course of a new and growing industry which continues to shift and evolve. RK: There’s room for a range of different products in the competitive landscape. At the end of it, it’ll be key to have a really quality product, and maybe do fewer things but do them really well. Q: If there’s one lesson you’ve learned in the industry, that you think other women should know, what would it be? YG: Being aware of trends as an investor in the industry. It’s shifting so quickly. It’s almost mind-blowing. Retail investors need to be aware of how quickly the industry is transforming and the trends that are coming out that make a buy and hold strategy not likely the most effective way to play this market given the volatility we are witnessing. RM: This is a 21st-century industry and women can play a leadership role from day one. For example, as a business leader in a new industry, I don’t think sitting back and just accepting the regulations at the government tables is acceptable. We’re getting out there and helping define the rules as the country moves forward. I think this kind of thing is really important. How do we encourage business investment and faith into the industry? I think having strong leadership, especially more women, can help. MK: When I started in the industry it was two camps: medical marijuana and marijuana. Then we started talking about cannabis. It’s an industry now, a true marketplace. I think that from an entrepreneur’s point of view it’s become a cannabis investing haven. Just the fact that there are so many people involved, and that you can go on the CSE website and find a company directory in cannabis is exciting. There’s a mining sector, and now there’s a focused cannabis sector. Welcome to the industry. It’s not going anywhere. RK: Don’t be afraid to be visionary. The industry is moving so quickly. Look to something you think you understand or that you can replicate with confidence. Another country, another model, don’t be afraid to try unique things. Don’t feel that you have to do what everyone else is already doing. The future is ours to create. Cryptocurrencies remain a hot topic in financial markets in the opening quarter of 2018, and Canamex Gold Corp. (CSQ) is moving to become the first company to issue a crypto-token backed by gold, and from its own project in Nevada no less. The team is also looking at working with other companies in or near production to help them finance with crypto-token gold and silver royalty streams, instead of traditional debt and/or equity financing. It is a new concept and takes some explaining, but the potential to eliminate further dilution for equity holders and create new models for valuation is both vast and fascinating. 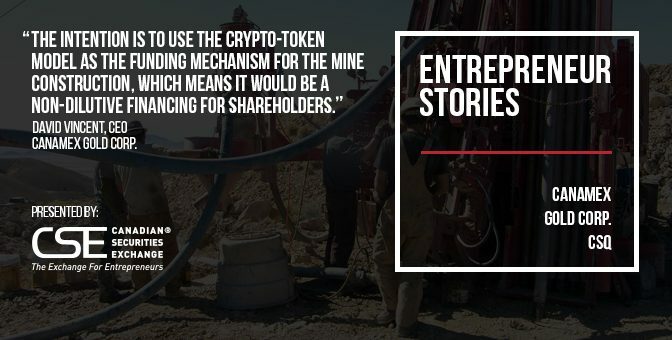 Canamex Gold Corp. Chief Executive Officer David Vincent recently gave Proactive Investors a look inside this new funding paradigm. Canamex Gold Corp. is literally taking currency back onto a gold standard with the introduction of its gold-backed token with an offering currently underway. We’ll get to your pioneering business structure in just a moment, but first, the Bruner gold project underlies the token. Tell us about Bruner and the plans there. We’ve got Bruner to the stage where we need to complete the engineering studies, the environmental permitting and then we should essentially be at the Preliminary Feasibility Study stage, for a mine financing decision. We hope to be at that point around the fourth quarter of this year. At that time, we will make a funding decision to construct the operation. It’s a win-win situation for shareholders and for token holders. Token holders will be buying the tokens at a significant discount to the spot gold price, and the tokens will be tradeable on the Ethereum blockchain, potentially at a significant premium to their issue price, including a speculative premium that we can’t define until it’s actually trading. This is a pioneering concept and has not been done by anyone else to my knowledge. Where did the idea come from? It came from looking at gold streaming royalty models, which traditionally is an agreement between two parties: one is the project owner and the other is the royalty buyer. Royalty buyers include such companies as Franco Nevada, Silver Wheaton Precious Metals and Royal Gold. Our concept is to take a gold royalty on the Bruner property, which has a small portion of the PEA defined resource, and tokenize it. Instead of the royalty being purchased by one party, it is purchased by many parties who hold the tokens and these will then have liquidity on the Ethereum blockchain. You announced an offering earlier this month for US$5 million. Are you at liberty to give us some insight on how that is going? It is going very well. There is a lot of interest, particularly out of the United States and Europe. We are receiving application forms and cheques. We’ll keep the private placement offering open until the full amount is raised and then launch a pre-ITO (Initial Token Offering) on the back of it. The advantage of coming in on the token offering now is that the buyers get a priority allocation into the pre-ITO at a discount. For those new to the cryptocurrency world and the concept of this offering, can you walk us through the steps? An investor commits to the current private placement offering and you are talking about an ITO. How do the two fit together? They are similar in many respects. The current private placement offering is more of a traditional financing mechanism under the current regulations and instead of being issued gold royalty crypto-tokens they will be issued a gold royalty token certificate. The names and details will be held in a register. Then the difference with the ITO is that the certificates can be converted to crypto-tokens at a price discount into the pre-ITO, and then they become tradeable on the Ethereum blockchain. And at that point the tokens have liquidity. So, chronologically, you close the offering and then there is an ITO. What happens next, and what will you use the proceeds for? The intention is to close the offering and go into pre-ITO, which would be priced accordingly and dependent on the spot price of gold at the time. But again, the pre-ITO offer price will be at a significant discount to the spot price. Looking at the monthly price chart of gold it appears very bullish. We expect that the price of gold could be over $1,400 an ounce in two or three months, then it means the pre-ITO price would be higher than the current private placement offering. Perhaps 10% higher. So, coming in now has distinct early mover advantages. The funds from the private placement and pre-ITO will be used to fund the company for the balance of this year to get to the mine financing stage in Q4. We may not do the main ITO until the third quarter. The advantage is that by that time we will know what the speculative premium is for these tokens on the blockchain, and then we can price the tokens according to the market price, and not the spot gold price. If there is a significant speculative premium the price of the tokens in the ITO won’t be anywhere near the levels we are offering in this private placement. Investors coming into the current placement are coming in at what could prove to be a very low price. The work you have done on the token to date affords you rights to do this for other asset owners, does it not? Correct. We are looking at a number of possible business models. We might set up a subsidiary newco, for example, that becomes like a royalty company and it raises capital via crypto-token issues. It might have a number of royalty streams in North America and other safe jurisdictions and the capital raised to purchase those royalties would be via crypto-token issues, backed by the gold and silver royalty streams. We’ve already deployed six exclusive token names on Ethereum. They have been deployed but not issued yet. So, we could use those tokens to fund additional royalties in the future through a royalty aggregation model. You are also a highly respected technical analyst of financial markets. What do you see for gold, and why? I look at long-wave analysis and currently we are in what is called a fifth K-wave, which is a Kondratieff wave. K-waves last 60 years, so we are on the fifth one of the last 300 years. This wave should peak in 2027, which is where I expect this current gold bull cycle to start topping out. We should see a mid-cycle correction in 2023. I suspect the price will move up toward the previous high of around $1,900 over the next five years, correct and then in the last part of the cycle into 2027 move much higher than $1,900. Basically, a full-on bull market. The fifth wave of the fifth K wave, which should generate a big move higher. And if you look at the fundamental background it is not good. Interest rates have been too low for too long and there is lots of debt out there, much of which will not be paid back, so defaults are on the horizon. Interest rates thus rise because of a global debt default scenario, where lenders demand a higher interest rate risk premium. What’s this going to do to the gold price? And silver is even more undervalued than gold. Silver has greater leverage to the upside. You could see Canamex launch a silver crypto-token before long, again using a royalty streaming model. Aside from Bruner, are there any projects in the Canamex portfolio investors should be aware of? We have the Silverton gold exploration project. It has similar geology to Newmont’s Long Canyon in Nevada. Long Canyon is a dolomite breccia. Our geologist Greg Hahn, who has built three mines in his career, thinks Silverton has tremendous upside and part of the money raised in this placement will be used for an initial drill program on the Silverton project. Any other insights from the intersection of cryptocurrencies and hard assets before we bring our discussion to a close? Just that I think we have tremendous value inherent in Canamex Gold Corp. We have three pillars to the business model: the Bruner gold development project, the Silverton gold exploration project and the cryptocurrency model for funding. Based on our updated Preliminary Economic Assessment, which came out in January 2018, the net present value (NPV) at the current gold price of Bruner is about $1.60 per share, using the current shares on issue. The stock trades at around $0.20, or an 88% discount to NPV. Where are you going to find better value than this in the market? This story was originally published at www.proactiveinvestors.com on March 6, 2018 and featured in The Public Entrepreneur. Learn more about Canamex Gold Corp. at https://canamexgold.com/ and on the CSE website at http://thecse.com/en/listings/mining/canamex-gold-corp.
MGX Minerals acquires zinc air battery developer ZincNyx Energy Solutions Inc.
Jared Lazerson, chief executive of MGX Minerals Inc (CSE:XMG, OTCQB:MGXMF), tells Proactive they’ve furthered their reach into the emerging energy space with the acquisition of ZincNyx Energy Solutions Inc.
Canadian group ZincNyx Energy Solutions has developed a modular energy storage system (ESS) designed for energy storage in the 5 kW to 1 MW range for extended periods..
Its technology consists of three main systems each using zinc and air to store energy in the form of zinc particles. This story was originally published at www.proactiveinvestors.com on December 15, 2017 authored by Andrew Scott and featured in The Public Entrepreneur. Learn more about MGX Minerals Inc. at https://www.mgxminerals.com/ and on the CSE website at http://thecse.com/en/listings/mining/mgx-minerals-inc.